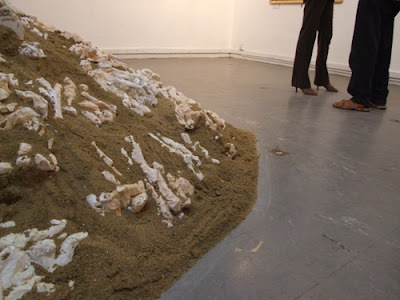 “Post- Barrelism: Erasing Camouflage”, An Exhibition of Paintings and Installations by Chandraguptha Thenuwarawas inaugurated on July 23rd 2009 at Lionel Wendt Gallery. The exhibition will remain open from July 24th 2009 to July 28th 2009 from 10am to 7pm. Parallel exhibition- A retrospective of Chandraguptha Thenuwara’s “Barrelism” is being held at Saskia Fernando Gallery from July 23rd 2009 to August 6th 2009.